Starting from Feb 1st 2018, ILD-FP & AC Series have been discontinued. As a possible substitute, please check out the ILD-UTP & SP Series or the LDB Series for details. 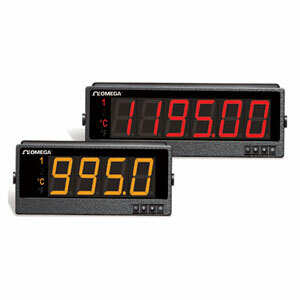 The "AC BIG Displays" (iLD-ACC and iLD-ACV) provide accurate isolated measurement of AC Voltage and Current signals. The AC Voltage model can be scaled for ranges from 0 to 400 mVac through 0 to 400 Vac. The AC Current model covers ranges from 0 to 10 mA through 0 to 5 Amps AC. The "Frequency Pulse BIG Display" (iLD-FP) provides accurate isolated measurement of frequency (from 200 Hz to 50 KHz) and pulse signals (up to 200 M pulses full scale) that can be scaled to any engineering units. The iLD-ACC, iLD-ACV, and iLD-FP feature BIG bright 7-segment LED's that can be programmed to change colors between RED , AMBER, and GREEN to indicate visual alarms. The BIG Display can be mounted flush in a panel or surface mounted with the included brackets. The entire BIG Display enclosure provides NEMA 4/IP65 protection. Whether panel-mounted or surface-mounted, the BIG Display does not need to go inside a bulky and expensive NEMA enclosure. Configuration of the iLD-ACC, -ACV, or -FP will be performed using RS-485 communication standard at half duplex and the configuration software that is available on our website. With the Ethernet (-EI) option you can "see" your meter and control your process through a web browser over the Internet from halfway around the world. With the Isolated Analog Output (-C2A) option, user can select output range for 0 to 10V, 4 to 20 mA, or 0 to 20 mA using serial RS-232 and the configuration software (this eliminates the RS-485 communication available on the standard model). Factory Scaling (-FS) is available if you prefer the unit to be fully configured before shipment.